Woodworking can highlight the custom and unique features of your home with style and functionality. Even the smallest changes, such as adding crown molding, can significantly update a room. Custom built-in cabinets and lighting can draw attention to a beautiful fireplace. 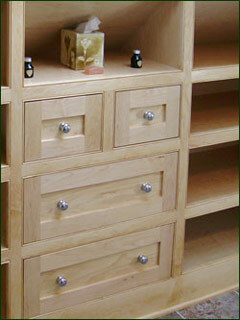 Woodworking can change a standard living space into a formal, one of a kind library. A custom cabinet can add luxury and storage to an odd sized bathroom or closet. Custom woodworking can enhance the character of themed rooms such as billiards, lodge, or in-home theaters. Let our craftsmen customize your home with our extensive experience in woodworking and custom cabinetry.